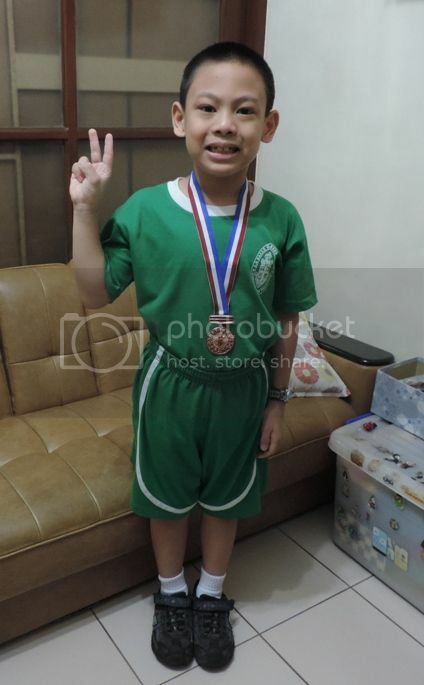 It was the first time he received a medal in sports, and he was very proud to show it to me when he went home from school last Tuesday after participating in the Grade 2 Intrams at LSGH. His homeroom adviser assigned him to the Baseball Throwing category. There was a little running involved which I didn’t know because when I went to school to get his report card a few days earlier, his teacher told me that he’d just do batting. My son wasn’t supposed to run because of his hip problem, but what could I do? I also wasn’t there to see what he was doing because I had work, but my son assured me that he didn’t run much when it was his turn to show his baseball throwing skills. I guess I didn’t really have to worry because he arrived home in one piece from school. I also knew that he greatly enjoyed participating in their Intrams because he was so fired up as he recounted the day’s events and bragged about his performance. He also told me that their class, Grade 2-A, also bagged the Principal’s Cup for this year’s Grade 2 Intrams. Congratulations 2-A boys! This entry was posted in Baseball Throwing, Grade 2 Intrams. Bookmark the permalink.